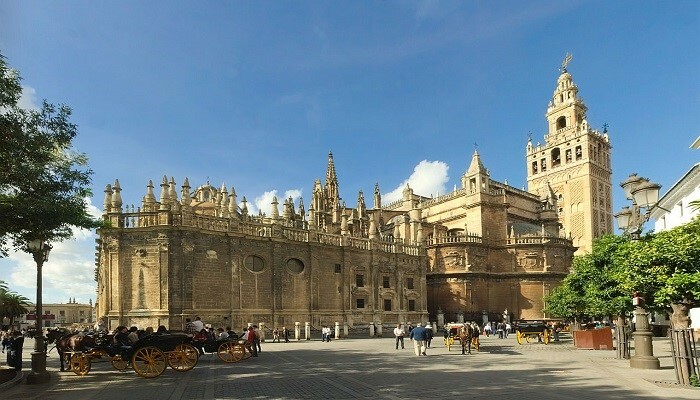 Did you know that Seville has the most extensive history in Spain? Would you like to learn Spanish in Seville? As you know, we have introduced you some Spanish cities –Madrid and Barcelona –which are ideal to learn Spanish. This way, today it is Seville’s turn. 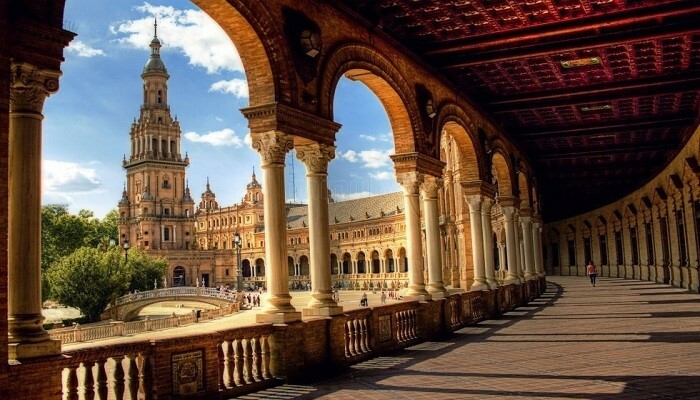 Due to the clima, its people and moreover to its huge historical and monumental heritage, Seville is nowadays one of the most visited and attractive cities for all the tourists arround the world. But why does Seville have an special colour to learn Spanish? The Andalusian capital city is an special city not only for its heritage but for the multiple possibilities that offers to enjoy the parties, traditions and cultures. Hereunder we will show you the principal motives for why Seville is the best place posible to learn Spanish. 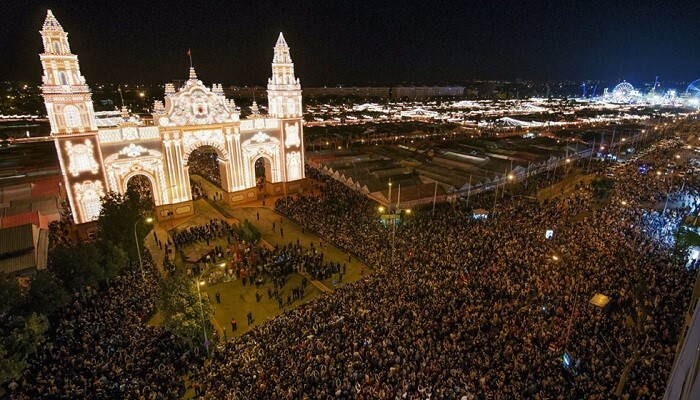 Seville’s fair is considered the most important and famous fery all around the world. You can enjoy a trip ridden by horses, being dressed as a flamenca, dance ‘sevillanas’ until death and drink manzanilla and rebujito, the typical drinks made by wine to enjoy the fair. The fair starts on a Monday with the fish night and traditional “Alumbrao”and concludes with a huge castle made by fire works on Sunday. 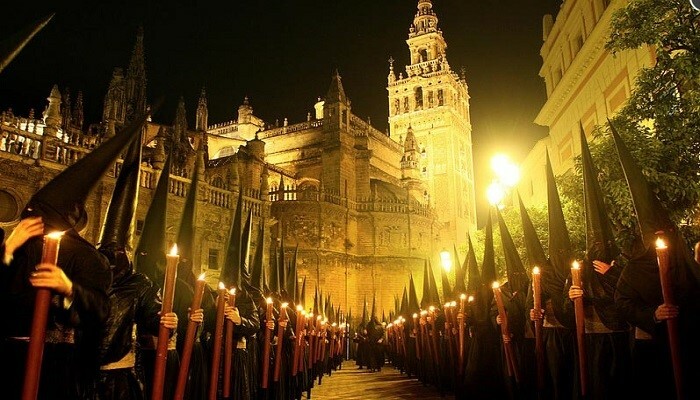 Without a doubt, one of the biggest spring dates in Seville is the Holly Week, also named Easter. Known worldwide each year brings dozens of thousand of visitors willing to enjoy the artistic and devotious spectacle. Each day the tourists have the opportunity to visit the different fraternities to live and feel the ambient which surrounds them. One of the principal attractions of the city is the big offert of places to take tapas and drink. 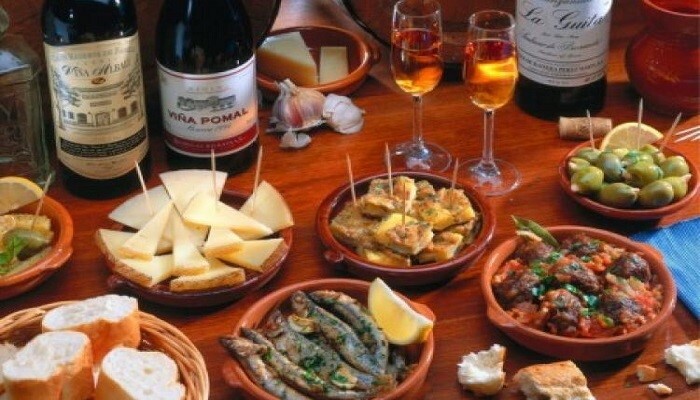 The centre of the city is ideal to take some tapas, but Alfalfa, La Alameda or Triana are also very nice zones to go for tapas. To take some drinks, Beltis Street, Cristóbal Colón Boulevard, Marquez de Paradas Street and the Arenal zone are the best. On summer the clubs and terraces are placed by the river and the Cartuja Island. The Cathedral is the Christian Gothic Cathedral with the biggest surface of the world and the third most important after Vatican’s Saint Peter and Saint Paul’s Cathedral in London. The UNESCO declared it a World Heritage Site in 1987. 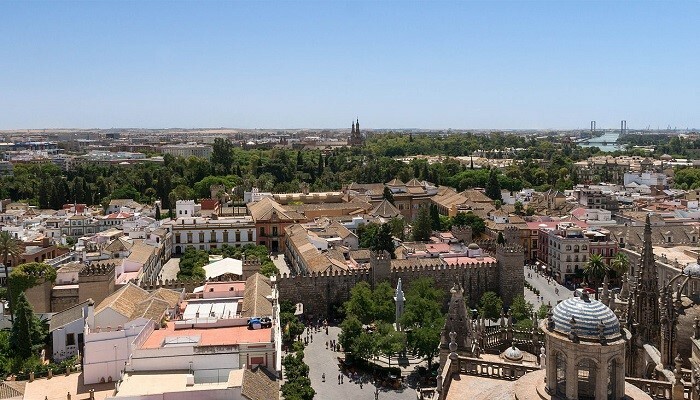 The Giralda measures 101 metes and you can contemplate the whole city which makes it worthy to go up the tower. Inside the Royal Chapel the King Sain Fernando, Alfonso X The Wise, Pedro I The Cruel and Cristóbal Colón are sepulted. The Royal Fortress is a group of palaces surrounded by a wall. Its construction was initiated in the Middle Age adding different styles, from the Islamic with their firsts denizens, to the almudejar and gothic style that brought the conquer of the city by the Christian troops. The place was the residence of the Catholic Kings and it has been used by a lot of Kings from the Spanish Royal Family within the years. Nowadays it has been used to record international films as the TV Series Game of Thrones. The tower was built between 1220 and 1221 by the order of Abù l-Ulà; with a height of 36 meters it would closet he entrance to the Arenal. The Golden Tower was part of the walls that defended the fortress. 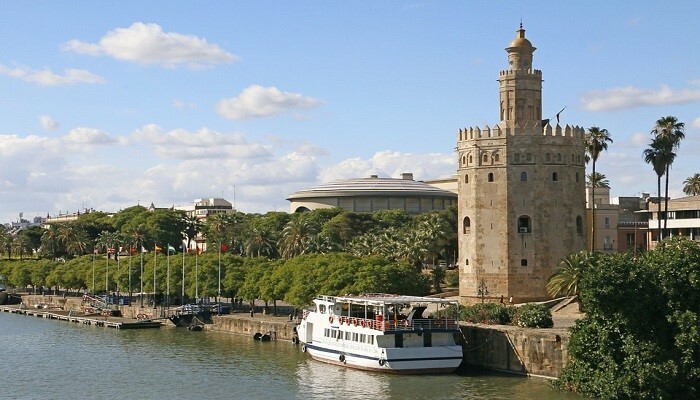 It was declared historical-artistical monument in 1931 and nowadays the Naval Museum of Seville is placed inside of it. This neighborhood is famous for being the cradle of the bullfighters, flamenco singers and flamenco dancers, with its own style in this kind of art. 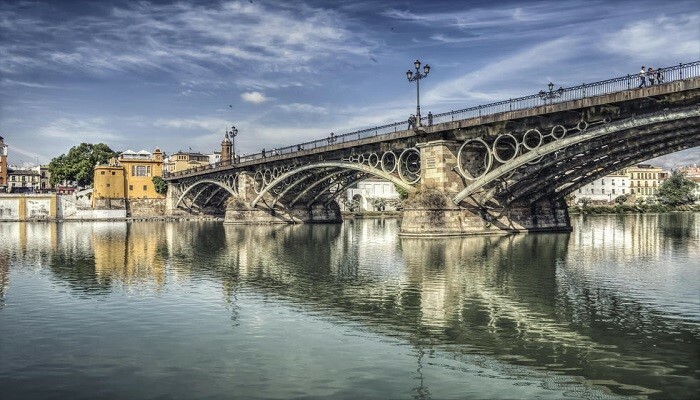 The best way to go into the neighborhood is by the Elisabeth II’s Brigde, known as the Triana’s bridge. Once crossed the bridge, we find ourselves at Altozano Square. The Ceramic Museum and the Santa María de las Cuevas’ Monastery. If you want to enjoy of a flamenco experience you must visit La Casa de Anselma in Pagés del Corro Street, where it is better to reserve before you go. The square is decorated with mármol, ceramic and brick. This combination of styles has been the scenary of a lot of famous movies like Star Wars: Episode II and The Dictator. It is located at the inside of the María Luisa Garden, declared Well of Cultural Interest, with an extensión of 34 hectares you can visit it for free and it is opened until 10 in the night. We recommend you to visit the Glorieta de Gustavo Aldolfo Béquer, one of the most romantic places of the garden. Now you know why Seville has an special colour to learn Spanish. 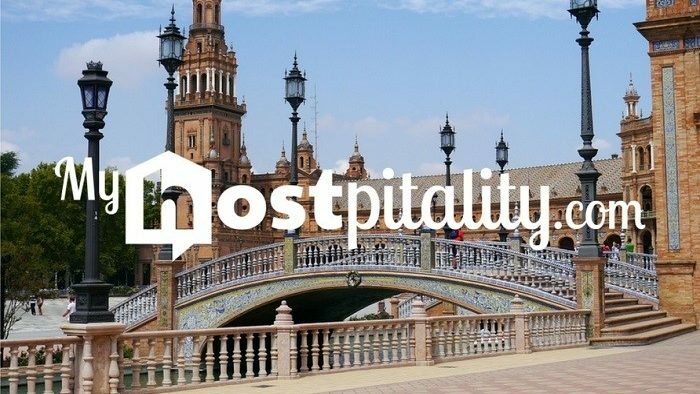 That is why with MyHOSTpitality you will be able to enjoy the beautiful city by making an Exchange. To end, we invite you to enter to our blog and meet other Spanish cities to learn Spanish.